From the 50th to the C6, What a Corvette Year! the frozen tundra, Detroit, and the North American International Auto Show. What an experience... you need to do this show at least once in your lifetime if you are a true automobile aficionado. 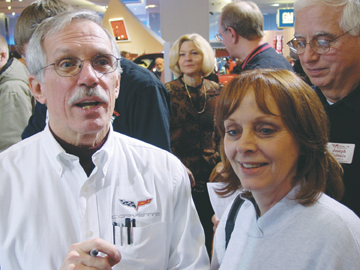 2003 was dominated by the 50th Anniversary of Corvette culminating in one giant party of Corvettes overtaking Nashville and Bowling Green during June. The 50th Anniversary party and caravan were the highlight of last year's events for me. This was my first caravan, and seeing everyone's excitement stands out as one of the greatest events that I have participated in on this side of the Atlantic since starting the Registry in 1997. 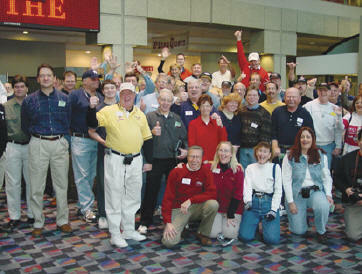 It didn't take me long to figure out that the warmest place in Detroit was a busload of C5 Registry members on their way to the Cobo Center to see the introduction of the new 2005 C6 Corvette. Our busload of anxious members looked like a "PRESS JUNKET" with all the cameras, video recorders and even a couple of cell phones that could take pictures so everyone would have a keepsake record of this fabulous opportunity. As we all know, the C5 brought Corvette into the category of "World Class Sports Car." I can assure you that the new C6 will position Corvette at the "Head of the Class." The evolution of the C6 is right. I found myself mesmerized by the enhanced new interior, which blew me away, truly exceeding my expectations. My hat's off to the design team who delivered a much-needed refined interior, but most importantly, 400 HORSE POWER of pure excitement delivered from a throaty SIX liter V8. Animal magnetism doesn't get any better than this! GM's new C6 Corvette (with optional Z51 handling package) is just a hair below our beloved C5 Z06 in performance and handling. It's pretty clear to me that when David Hill and his league of engineers were attending the previous six C5 Registry Birthday Bashes, they were not only visiting with members, but also listening to what Registry owners/ drivers had to say. I can tell you that there is no other car company that has this type of owner interaction with its purchasers. It is definitely a World Class Winner! As the Precision Red C6 rotated around, I thought how proud I was of David Hill, Tom Peters and the rest of the C6 gang for a job well done and the smiles our members will have when they get behind the wheel of their new C6. Their dream will become reality! A personal thank you to David Hill for being such a gracious host during the Auto Show. His "behind the scenes" efforts allowed us an early entrance into the show and he graciously gave us nearly a two-hour detailed discussion on the C6 without a break. David then headed over to the C6 chassis model and answered questions non-stop for the next four hours. PassionÉ that's the David Hill I know! together. Yes, it was COLD, 9 degrees and snowing outside Saturday night during the Registry dinner, but inside it was warm with friendship. There was a buzz across the room as the "press junket bunch" was dissecting all they had learned today about the new C6. 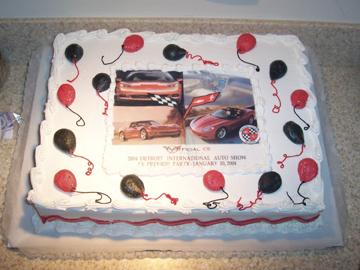 After dinner we all headed off to Ed & Shirley Duprey's home for dessert and a special C6 celebration cake. The party and fun just kept going! The gang's all here -- moments before we rush the doors at Cobo Center! It was a great event (North American International Auto Show) for a great Car (C6 Corvette) with great people (C5 Registry Members). A special thanks goes out to all those who helped coordinate this fun event...Tony (Zippy) and Pat Vernogis [C5R# W1276], Ed and Shirley Duprey [C5R# W0276], and Colleen Egan [C5R# Y4883], just to name a few. A big C5 THANK YOU goes out to our guest speaker, Dave Peacy, who gave a great C6 presentation during dinner! Return to Le Mans... Again! On the other side of the Atlantic, our two past trips to Le Mans could never be forgotten. We've received a great many inquiries about another trip. It would only be fitting that we plan another excursion to Le Mans for 2005 when Corvette debuts the C6-R race Corvette for the most famous 24-hour race in the world. All of you that have been asking about another European trip, clear your calendars for June 2005É we're going back! I want to thank all of you for the kind words, emails, letters, and phone calls I’ve received from the greatest members in the world regarding my article in the Fall 2003 issue. Yes, everyone is right, my wife did not know that I subtly revealed her age in the photo caption until she read the column after it was published. You all were very kind to state that she certainly looks much younger than she is, and you’re right! Months later, I’m still working the “honey do” list for my indiscretion! I know I’m supposed to be discussing the latest and greatest item for this Power Chat column, but you see, I just returned from a fantastic time in Detroit surrounded by fabulous Registry members and I have this need to tell you about it. We no sooner hit the tarmac and I knew I was not in sunny Florida any more! This fact was reinforced when the young lady at the rental car counter said to Dan, “What size PICKUP do you want?” She had great insight, as it was obvious the only way we were going to get around in this weather was with a 4X4. A few minutes later and we were at the Crowne Plaza meeting and greeting all of our wonderful members who had come to Detroit for this once in a lifetime C6 unveiling. As snow was falling, we formed a caravan and headed over to Les Stanford Chevrolet in beautiful downtown Dearborn where we enjoyed great hors d’oeuvres and had a fabulous visit with our hosts Gary Stanford and Scott Montgomery. The whole gang at Les Stanford really knows how to roll out the carpet for our members. We were having so much fun that I thought they would have to lock up the dealership with a number of our members still inside as the evening came to a close because most of the members had spent the entire evening trying to win one of 1,000 cars and trucks in the OnStar “Push the Button” promotion. 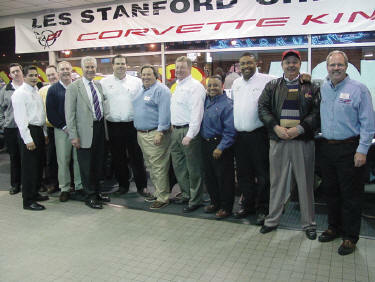 The fine folks at Les Stanford Chevrolet really know how to throw a party! Many thanks to Gary Stanford (5th from left) who made us all feel right at home! of them for taking the time (after I pestered them) to allow me to get a feel for what these two performance vehicles bring to the table. The next day all of us gathered for a quick breakfast and then we were off to the Chrysler Museum. We had a great time visiting the enemy...I mean, the home of the Viper. 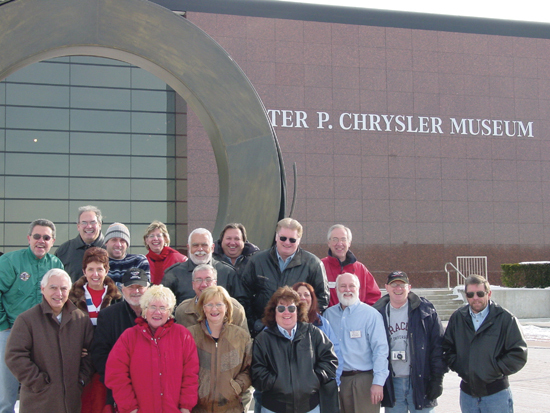 I must say that I learned quite a bit of history about Walter Chrysler and his vision for his company. He was definitely a man on a mission! After the tour, everyone headed out to explore exciting Detroit. Dan and I headed north to see Danny Kellermeyer who is crew chief for Jack Cauley’s C5 Corvette, which will be running at the 24 Hours of Daytona. Danny and his wife Michaelle were so kind to show us around his shop and discuss with us many of the C5 Corvette racing items he was working on for Daytona. On the road again...towards the hotel, but what were we thinking? It’s 5:00 pm and it’s bumper to bumper in Detroit. No doubt, we had lost our minds! 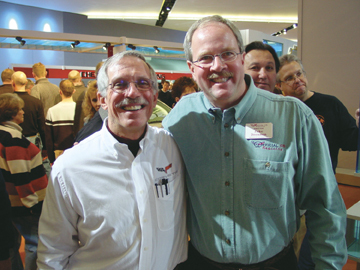 But then the cell phone rang and surprise, surprise, it was John Cafaro (designer of our C5’s) calling because he heard we were in town and wanted to get together and visit about our favorite Corvette. With John’s guidance over the cell phone, we took several detours and finally caught up with John and his lovely wife, Beth, and had an enjoyable time visiting. Once the traffic cleared, we were back to the hotel’s hospitality suite where everyone met to watch the live broadcast of the Black Tie Charity Preview from the Cobo Center. C5 or C6 -- The smiles are always there! David Hill and C5 Registry Director Jake Drennon enjoy the debut. Only in Detroit are these kinds of things on TV! The Oscars have nothing over this televised program. It’s Saturday, January 10th, the big day! Up early, on the bus, and we headed off to the Cobo Center with a number of our members following in their rental cars. As I’m visiting on the bus, my memory will always be...the excitement everyone shared, the hope that their expectations about the new C6 would be exceeded, and how many different types of digital cameras and video equipment there must be in this world. Let Them Eat Cake .. The Duprey's went all out and created a special C6 confection. Once at the Cobo Center, we all rallied around the Joe Louis statue, everyone looking marvelous in the latest C5 Registry apparel. Smiling as big as the statue was Tony (Zippy) Vernogis [C5R# W1276] witnessing his dream come true of the Registry coming to Detroit for this very special event. We were quickly joined by 100+ members of the American Corvette Club wearing their bright yellow shirts sponsored by Cauley Chevrolet [Corporate Member# XC021]. Colleen Egan [C5R# Y4883] had arranged with David Hill for us to have VIP treatment and be allowed into the show 45 minutes early before the doors opened to the public. We all felt pretty special as the security guards checked us in to the main hall. A short walk and there it was! No magazine photos, no Internet photos, no television ad...we are here LIVE!!! I’m impressed!!! I’ve just watched my hero, our fabulous leader, Chief Engineer of the greatest Corvette ever produced, talk six straight hours about the new C6. David Hill never missed a beat reviewing the new Precision Red C6 from emblem to emblem and door handle to door handle (even though there really isn’t one). My impression from his discussion was that every item one could imagine was improved or fabulously enhanced from our current C5. My game plan was to film every moment of his presentation as the 2005 Precision Red C6 turned on its platform. I was able to capture about an hour and ten minutes out of an hour and a half presentation. But what I’ll always remember is that once the formal presentation ended, David headed over to the custom built and beautifully painted C6 chassis cut-away and continued answering questions. Yes, that’s four and a half more hours of signing autographs, posing with members for photos...and I believe if there had been a baby in the audience, he would have kissed it. He looked like a politician in full stride beaming about his new campaign of launching the greatest Corvette ever built. I’m sure his schedule was tight as we learned he had been on a non-stop pace since Sunday, January 4th, the night of the Global C6 unveiling at the downtown Detroit Opera House. Email after email has come to us from those of you who attended thanking David Hill for his valuable time that he gave to all of us. Before we know it, our time at the Cobo Center has flown by and we’re headed back to the hotel. Just enough time to talk about all we had seen and the magnificent impressions it left with all of us. But the night was still young...we were off to Ginopolis’ On The Grill for another spectacular Registry dinner. After dinner our guest speaker Dave Peacy from GM treated us to a C6 Power Point presentation that everyone really enjoyed. The French Queen, Marie Antoinette, is credited with the statement “let them eat cake,” and that’s exactly what we did as we were all invited to the home of Ed and Shirley Duprey [C5R# W0276] after dinner. discuss the future of Corvette. Of course... no one lost their head over it! I can’t thank the Duprey’s enough for allowing everyone to end this day in such a warm and friendly setting that their home provided. When we all get together at April’s (22nd to the 24th) Birthday Bash, ask anyone who attended this once in a lifetime experience what it meant to them. I just want you to hear it from them!